This weekend the women’s Subaru National Road Series will kick things up a gear as Victoria’s picturesque Surf Coast Shire hosts the 2015 Amy’s Otway Tour. 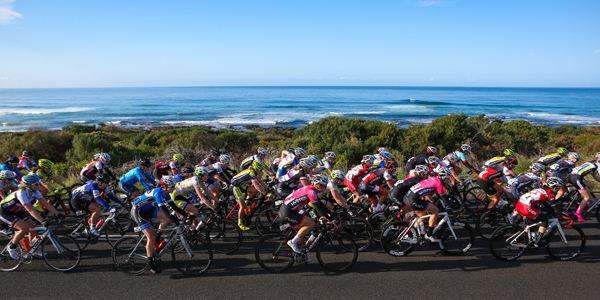 Set to be twice as good in 2015 with the addition of an extra stage, a field of close to 60 riders will be in action across the weekend beginning with Amy’s Criterium on the popular Lorne waterfront on Saturday September 12. The iconic Amy’s Otway Road Race returns on Sunday with riders to take in the breathtaking Great Ocean Road during the 109km race. Day one will see a fast flowing hot dog circuit on Mountjoy Parade and the pace will certainly be on from the gun as riders look to take the bonus seconds on the four intermediate sprints on laps 6, 12, 18 & 24. With an early start on Sunday morning, recovery from the criterium will be paramount. Luckily the stunning Louttit Bay is just a stones throw away from the finish line, so there will be no excuses not cooling after some full blooded racing. Day two racing gets underway at 7.30am, one hour before the mass start of Amy’s Gran Fondo in Lorne. Riders will travel along the picturesque Great Ocean Road, before making the punishing 10km ascent at Skenes Creek to contest the Queen of the Mountain climb. The peloton then head through the hills of Forrest, come back towards Deans Marsh, then finish with a difficult 10km climb to the finish line in Benwerrin. Despite taking a heavy fall at the recent Sam Miranda Tour of the King Valley which saw her taken to hospital, 2015 individual rankings leader Ruth Corset will take to the start line in Lorne. “I have recovered well now after my fall at Tour of the King Valley,” said Amy’s Classic runner-up Corset. “I landed pretty hard on my sacrum so had a fair bit of bone bruising which is slowly getting better. “But I am really looking forward to Amy’s Otway Road Race as it is a race that suits the climbers. Tour highlights: GEM – Sunday 20 September at 12pm & FOXSPORTS 3 – Tuesday 22 September at 6pm.